Getting into an Uber the other day, my sister remarked how unthinkable it used to be to get into a stranger’s car, and how it still feels a little funny riding in the back seat of someone’s Prius for a trip across town. Her 23-year old son, my nephew Jack, meanwhile, can’t imagine how people used to get around back in the ‘old days’ of 2010. 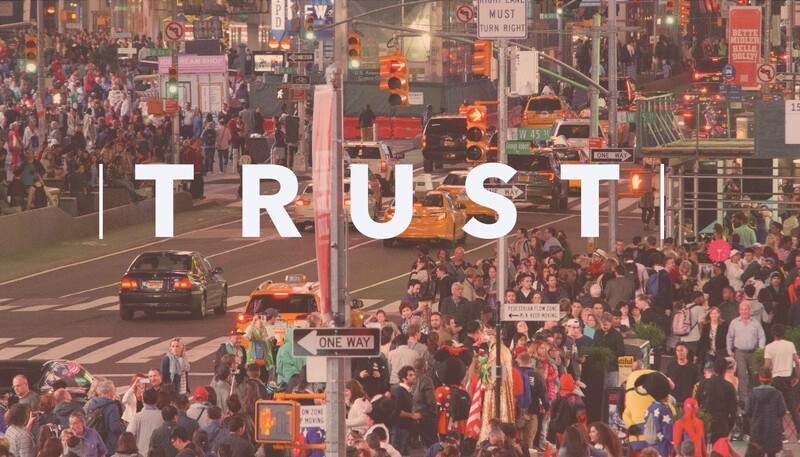 The entire notion of trust has morphed dramatically in the past decade. On the one hand, trust in traditional authority — government, media, businesses, the church — has eroded to historic lows. Along with it, individual professions have become less reliable sources of trusted information. Heck, even baristas rank higher on the trust index than sales and marketing folks. Trust hasn’t evaporated; but its locus has moved. Author Rachel Botsman, who studies societal trends in trust, has observed that trust has moved from a local phenomenon (my neighbors know who in the neighborhood is trustworthy), to an institutional model (financial institutions, governments reliably keep track of records), and now to a distributed model (individuals trust other individuals in far-flung networks). At the base of a trust stack is the idea: “do I trust this idea?” That is, can I see myself renting my house to a someone I have never met; taking a ride from them? ; going on a date with them? If the idea is viable, the next layer in the trust stack is “do I trust the technology platform?” Does the technology deliver on the promise — is there actually a room available? a car will show up? should I enter my credit card info? And, the top layer is “do I trust this particular person?” Is there enough info about the driver/host/date to make me say yes? When a solution has ticked all the boxes, it creates a network of trust. Distributed trust creates both supply with demand, powering an entirely new, modern business model. Botsman’s research and trust stack fascinate me. As the CEO of a company whose customers are small and medium-sized growing businesses, I was curious: does the trust ladder apply only to the data-rich Airbnb’s and Uber’s of the world? Or is it transforming small businesses as well? Are we in the early days of what this new model of trust will do to business? HubSpot’s small and medium business customers include a rich diversity of trust platforms. All of them have figured out the idea rung; built the technology platform rung; and determined how much information is necessary to each party in the trust relationship — photo? name? rating? demographic info? length of service? estimated price? — and combined it into a friction-light customer experience that leads to a transaction. They’ve centered their businesses not on what they sell, but on how they sell. TheKnot is an online wedding ‘registry’ that has full directory of over 250,000 bridal salons, caterers, photographers, florists, venues, DJs, and wedding planners. TheKnot was an early entry in the platform/trust stack model, with a start in 1996. While weddings are ideally not a repeat purchase, TheKnot provides ways for wedding party members and guests (all potential future clients) to participate in the site (gift registry, videos, well wishes) so that its word of mouth spread is its most powerful marketing voice. Gigmasters is a similar model where consumers and small business planning a non-wedding event can find photographers and DJs, not to mention Elvis impersonators, auctioneers and inspirational keynote speakers. While Airbnb focuses on homeowners who occasionally travel and are able to rent out their home, Vacasa specializes in owners of a second home — say, a beach house or ski lodge — who might only use it themselves for a week or two out of the year. Vacasa manages not only the rental listing, but also provides property management and cleaning services. Less than 10 years old, Vacasa has more than 10,000 homes under management. TruckIT connects truckers with construction contractors for just-in-time hauling services. The TruckIt platform handles scheduling, billing, trucker preferences, and truck location tracking to remove as much friction from the process as possible. Barn2Door connects farmers who have fresh produce with local chefs for the farm-to-table restaurant business. Since 2015, the app provides a eCommerce experience for selection and delivery/pick-up, a frictionless alternative to highly time- and location-constrained farmers’ markets. White Label Dating is a dating software solution designed used by hundreds of micro-communities (e.g., readers of a particular local newspaper or special interest magazine) to match romance-seeking adults. Quaver.io manages the discovery, scheduling and payment processing for students and music teachers. Care.com got its start in 2006 helping parents find daycare for children, and has since expanded into elder care, pet care, and house cleaning — a community of over 10 million caregivers. What businesses have you encountered — or founded — that leverage the trust stack, bringing together distributed communities in a lightweight customer experience?